Here comes trouble girls. Quick into the water. 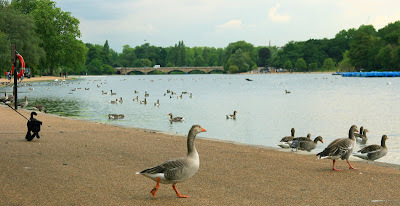 This lake built by Queen Caroline (wife of King George II) in 1730 divides Hyde Park and Kensington Park. The Serpentine bridge that you can see in the distance is the division between the Serpentine in Hyde Park and the Long Water in Kensington Park. Marley - On his way to the auditions for the next Tony the Tiger, Barry realised he'd forgotten his costume! amisare waswerebeen - Finally, Anthony found a place where he could be himself and go on the prowl. This is a fabulous picture! I love it! Just to show you how much I admire your blog. I think it's wonderful! That litlle black thing was very keen about the geese, huh? I've been to this park numerous times! And I love all the birds. The swans, especially. It's a beautiful place. But I never knew of the boundaries - thanks for teaching me something new today! Memories. After London marathon this year I walked there and over that bridge on my way to my room and the bathtub in Paddington. Very nice to be reminded. London marathon gave me a very good healthy pain in my legs and a lot of endorphins. Sometime the situation is a total opposite. Yes, once I was bite by a duck when I thought: "here comes trouble girl!"